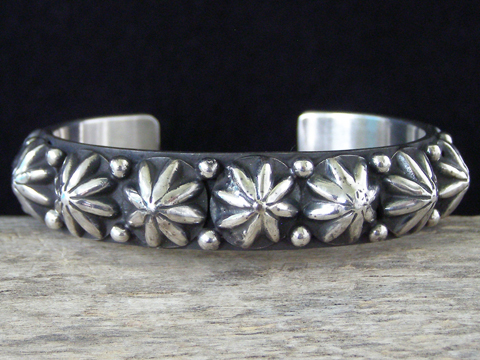 Happy Piasso Starred Button Studded Bracelet size 6"
Happy Piasso and her husband Rudy Willie work together as a couple smithing silver. They usually use Happy's hallmark to sign their pieces, though both are involved in the production. They are best known for making link bracelets and pendants. This slimline bracelet is one-half inch wide and is studded with repoussée starred buttons further complemented by raindrops along the edges of the cuff. This is a wonderfully textured piece with nice heft and fine, clean workmanship. Hallmarked H. Piasso and stamped Sterling inside. Total inside circumference (including gap): 6"